Bolt loading can vary greatly during product testing and operational conditions, enabling premature and unexpected structural failures to occur. This makes measuring and verifying bolt preloading essential to compensate for the unloading that naturally occurs over time. In addition, depending on testing and operating conditions, knowledge of how bolt load changes over time is necessary for lightweight and efficient structures. Depending on certain design choices, verification of bolt preload and load change is critical. Ideally, every bolt used would be made from high-strength steel. However, design requirements often necessitate the use of more ductile bolt materials such as stainless steel, bronze, aluminum, or plastic. Depending on the stresses experienced, these materials can undergo plastic deformation. For instance, stainless steel fasteners commonly have a yield strength 30 percent lower than their alloy steel counterparts. If the bolt preload is too large or too small, the stresses transferred through the bolt may exceed yield strength far earlier than alloy steel. By implementing bolt load auditing, not only can the initial load be measured, but leaving the sensors in place enables the logging and monitoring of the bolt load during testing and operation. This allows for plastic deformation to be monitored and the failing bolt to be replaced or redesigned. Gasket hardening and collapse is another area where proper preload is necessary. Since designs incorporating gaskets expect some form of gasket degradation, a specific bolt preload is determined to mitigate this. A higher or lower preload can cause premature failure of the gaskets, leading to leaks in the system. This is mitigated by verifying the bolt preload using bolt load auditing techniques. Additionally, gaskets may be monitored by permanent placement of load sensors, enabling better understanding of gasket changes over time during testing and failure anticipation in an operational environment. The act of tightening a bolt compresses a structure locally, albeit minimally. Often this means very little, as the surrounding structure is unaffected by the small change. However, if there are multiple bolts in close proximity, applied torque to one bolt can lead to the unloading of a neighboring bolt. This effect is very prominent in gasket applications, since close spacing causes the gasket to compress further than expected. By performing load auditing and placing load sensors on all surrounding bolts, any improperly loaded bolts can be discovered, and torque parameters for each bolt can be adjusted to compensate for the load changes caused by nearby bolts. Unexpected or greater-than-anticipated stresses or vibrations during testing or operation can also lead to significant bolt unloading, bolt elongation, and gasket collapse, resulting in structural failure. Measuring the bolt load over time using auditing sensors enables the detection of problem areas, allowing bolt preload and possible design changes to be made. While the above failure scenarios can be traced back to incorrect bolt load, there is one scenario where that is not easily the case. In single/double lap and clevis shear joints, inadequate loading can cause the bolt to bend under peak loads. The bent bolt allows for peak stress conditions in the lugs, leading to failure via shear tear out. Depending on the complexity of the structure and the degree that the failure damaged the rest of the structure, it may not be evident that inadequate loading was the cause of failure. Instead, a costly and time-consuming structural upgrade would take place, when all that was necessary was a properly preloaded bolt verified using bolt load auditing procedures. Since one of the primary purposes for bolt load auditing is the verification of the actual bolt preload (the other being an understanding of the change in bolt loading over time), it should be noted why torque auditing data should not be used to calculate bolt preload. Assembly conditions are never 100 percent clean. Any environment will have airborne dust and debris. Bolts can have residual machine oil on them. Changes in bolt plating, which may not change bolt strength, do change the bolt's surface properties. All these aspects can change how much a given amount of torque will translate into the actual bolt load. This can result in changes in estimated bolt preload by +/-35 percent. This wide margin makes it essential that bolt preload is measured directly, instead of estimated mathematically. Actually performing bolt load auditing is very simple, and FUTEK load cells make it painless. 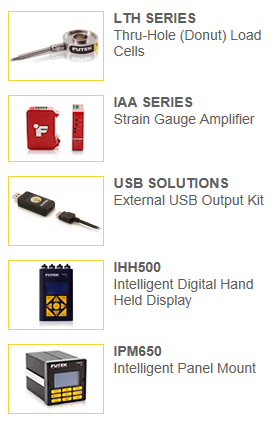 You only need a few things: an appropriately sized thru-hole load cell to fit your bolt, two hardened washers, a FUTEK donut load cell (or thru-hole load cell), and either a FUTEK panel-mount, handheld display, or USB dongle. Attach the load cell to your selected receiver, then just sandwich the load cell between the two washers and torque the bolt down per your specified torque parameters. Check and record your readout of bolt preload, and that's it! You'll be within your desired tolerances, or you'll have to make adjustments -- but now you'll know, without a shadow of a doubt, what your actual bolt load is. FUTEK's LTH Series offers several miniature load cells appropriate for this form of measurement testing. 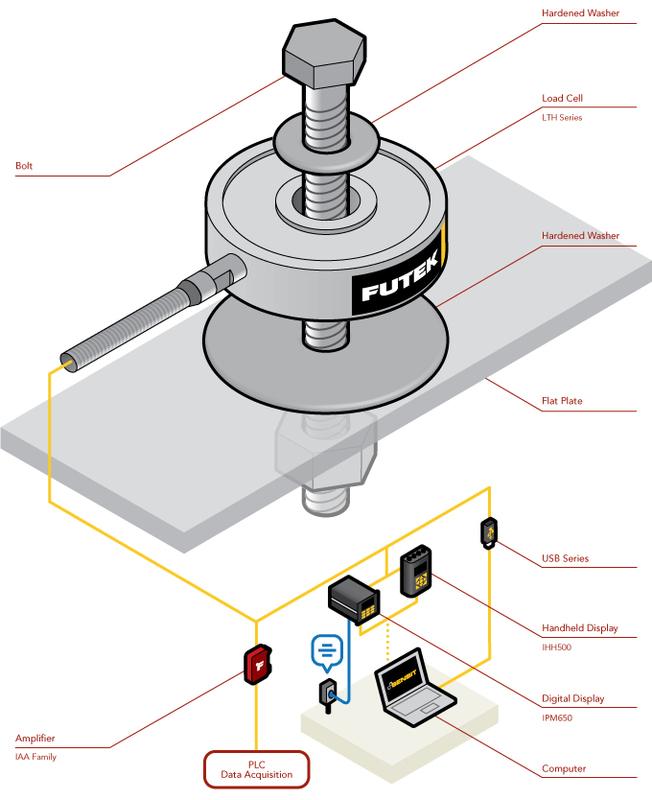 In the above application, FUTEK's LTH load cell is installed between the bolt head and the nut, where it can measure the load as torque is applied. FUTEK engineers recommend including a hardened washer between the load cell and the nut to avoid high friction and maintain flatness on the thru-hole during tightening and untightening. As the operator begins to fasten the bolt, the load cell will measure the force applied. This data can be monitored throughout testing via FUTEK's IPM650 Digital Display or IHH500 Handheld Display; or it can be streamed to a computer via FUTEK's USB solutions. Operators and engineers can then review this data to verify whether or not they have reached the desired tension on the fastener, stud, or bolt via SENSIT Test and Measurement Software. Overall, the benefits of installing thru-hole-type load cells into your assembly process include: avoiding damage to bearing surfaces, decreased problematic tightening of large bolts, ease in untightening, and simultaneous tightening improvements. FUTEK has created an online bolt torque calculator to better assist you. Note: All FUTEK application illustrations are strictly conceptual. Please contact FUTEK with questions. Copyright © 2016 by Nelson Publishing, Inc. All rights reserved. Reproduction Prohibited.